This Coffee Walnut cake features a rich cream cheese topping infused with actual coffee. This cake is perfect for those who enjoy their cakes nutty, or are somewhat a coffee addict. Preheat the over to 180 C. Grease two 8 inch pans and line the bottom with baking paper. Set aside. Using an electric mixer, beat softened butter and brown sugar until pale and light. Add eggs one at a time. Mix well (about 1-2 mins) before adding the next egg. Add coffee and stir it in well until combined. Fold in flour and walnuts until just combined. Place the cake tin in the oven and bake for 25-35 minutes until golden brown, or until a skewer inserted into the center comes out clean. Remove from oven and let cool for 5 minutes, before removing from cake tin. Allow to cool completely. Mix coffee powder and boiling water in a small bowl until all granules are dissolved. Set aside to cool completely. In a large mixing bowl, beat creamcheese and butter with an electric mixer until smooth. Add in icing sugar and continue beating. Next, add in the coffee paste and continue to beat until it is mixed well. Taste the creamcheese mix as you go, making sure it is not too bitter or too sweet. If the mixture is too thick, add a few tablespoons of heavy cream to thin it. Take a small dollop of the creamcheese and smear it on the centre of your cake board. Place the first layer on the cake board and press down firmly. Spread half the creamcheese on the top of the cake, and flatten as evenly as possible. Next, place the second layer on top of the first and repeat. 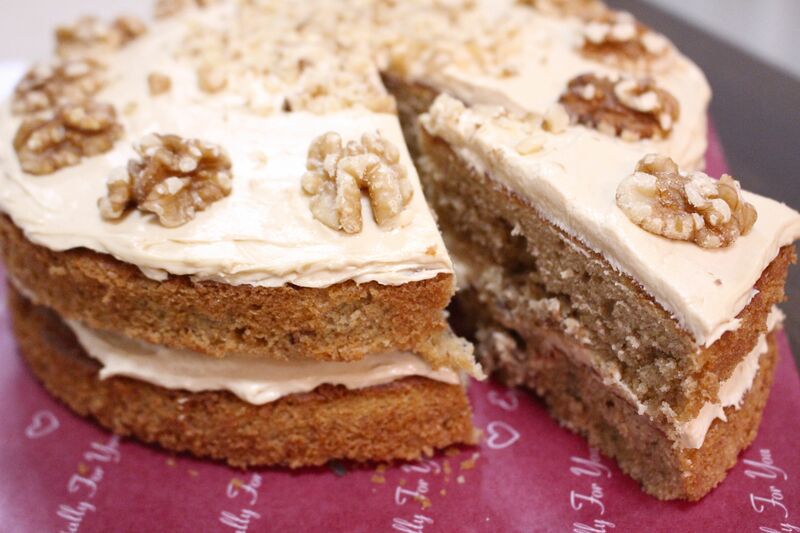 Decorate the cake with walnut halves and chopped walnuts.